We are building beginner friendly mountain bike ramp, but we could also use this ramp for BMX bikes and skateboarding too. Building this mountain biking ramp is relatively simple even if you have very little woodworking experience. 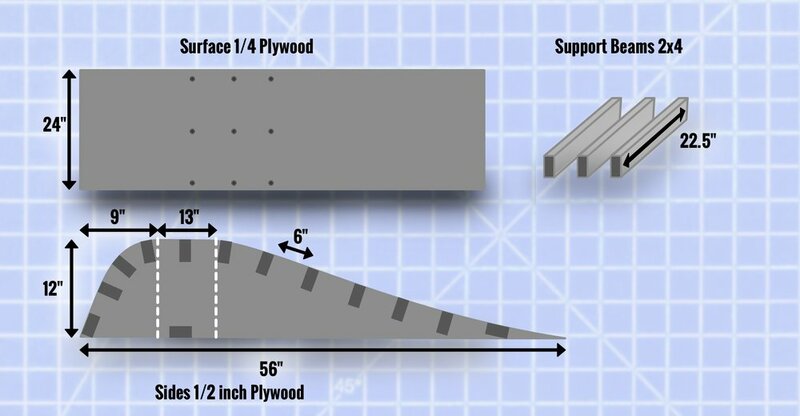 Do remember this is not bike ramp blueprint, but a general ramp building guide. Feel free to modify things as you see fit. Having a wooden jump that you move around is not only a great way to have fun, but also to help develop better bike handling skills. Instead of traveling to a bike park, why not just bring the bike park to you? Additional helpful tools: Skill-saw, Impact driver, Square, Sander, Clamps, a hose. Things to keep in mind: The ramp lip (take-off) and landing both measure 24 inches wide. This is what a standard piece of plywood measures when you cut it down the middle (lengthwise). If you're building both the lip and landing, you'll only need 1 piece of 1/2 inch thick plywood. You can even have Home Depot / Lowes make those cuts for you (the cuts are free). I used 2.5 inch screws to fasten the support beams to the 1/2 plywood sides. I used 1.5 inch screws to attach the surface to the frame. The surface is 2 pieces of 24inch wide sheets of 1/4 inch thick plywood stacked together. I cut those at the very end. To bend the plywood, you'll want to dampen it with water and then very very gradually bend it. Mine cracked due to my impatience, but I don't think that impacted the structural integrity. You always want to build the ramp so that the base frame extends past the actual take off and landing area area. This is to prevent the ramp from tipping. In my crude drawing below, that essentially what the extra 9 inches is for on the left side of the "peak". Note: In my video I spaced the support beams out by 9 inches. I would recommend spacing them out by 6 inches instead. Notes: The landing should be less steep than the take off. I'm pretty stoked with how this project came out. It's far from perfect but the general shape is pretty spot on. Making the curves less aggressive or simply just "octagon" it with multiple small sheets of plywood. 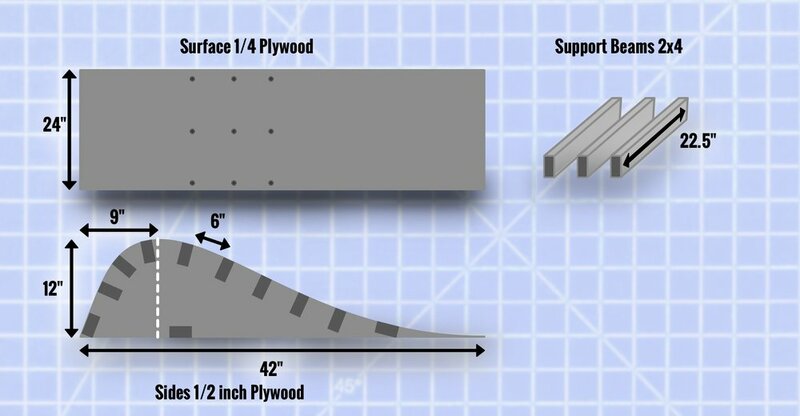 A few users comment on a technique called "Kerfing" or "Kerf Cuts". These would be necessary on subtle curves, but the curves you see at the ends would have been much easier to make had I gone that route. 12 inches is the tallest I would build the frame of this bike ramp. 12 inches is quite tall for a beginner ramp that's only 24 inches wide. 8.5 to 11. inches would probably work just as well with the same length frame. Another thing to keep in mind: Ramps will always look much bigger and steeper once they are fully assembled. If you're unsure, err on the side of caution and build the ramps less steep (or smaller) if you're in doubt.